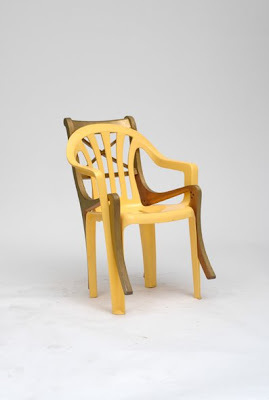 Martino Gamper's process for his 2007 project '100 chairs in 100 days'. "Using a stock pile of discarded and donated chairs Gamper creates his new chairs from elements of existing ones. By deconstructing the chair he gains a new insight into its construction and use of materials which informs the creation of the new design. The process is immediate, spontaneous like sketching in three dimensions" (from Design Museum's exhibition).